HOME PRODUCTS &AMP; SERVICES DIRECTORY OF SUPPLIERS SAVANT AUTOMATION, INC.
Savant Automation, Inc. sells, engineers, installs, and services a full line of Automatic Guided Vehicle Systems including automatic guided carts, unit load carriers, tow units, fork and platform AGVs. In addition to supplying state of the art AGV systems, Savant provides AGV system requirements analysis, concepting, budget pricing and simulation services. As a full-service, turnkey AGV system supplier, Savant is a provider of complete systems direct to end users or through 3rd party integrators. Formerly part of Siemens Dematic, Savant’s AGV technology and products are manufactured in the US. Savant Automation, Inc.’s staff averages 20 years of AGV experience and has supplied hundreds of AGV systems in all industries. They are ISO 9000 certified. Savant's headquarters is located in Grand Rapids, MI. Their facility includes manufacturing, office and demo areas. 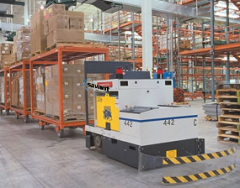 Savant Automation offers unique, state of the art AGV technology, designed and supported in-house. 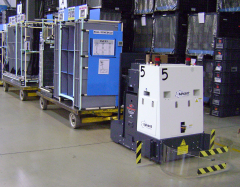 Their AGVs use internal navigation and do not require installation of above floor targets, floor wire or tape. Routes and system operation are easily changed using a Windows PC program. Systems are quickly installed in existing or new facilities. Systems are scalable with added vehicles and unlimited ‘virtual’ paths. Automatic guided vehicle systems help automate material handling even if your throughput does not warrant fixed path conveyors. Suitable for short or long distance moves, automatic guided vehicles can actually improve response time for material movement. 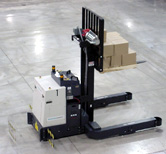 efficient, dependable, and versatile material handling solution. View More Announcements from Savant Automation, Inc.